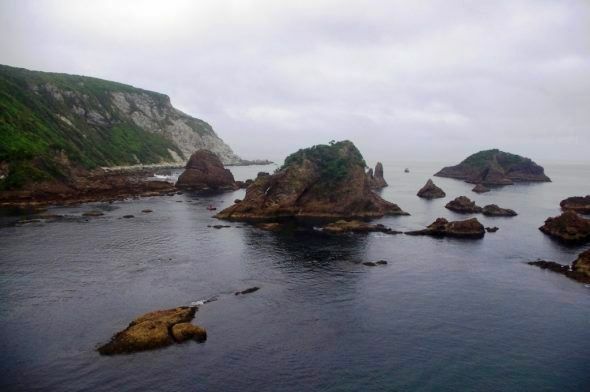 Te Papa scientists Alan Tennyson and Colin Miskelly recently joined a Department of Conservation-led survey of seabird colonies in remote Chalky Inlet and Preservation Inlet in southern Fiordland. The team made the most of an extended spell of fine weather to land on an astonishing 77 islands. Colin Miskelly summarises some of their more notable discoveries. Most tourist impressions of coastal Fiordland are based on their experiences from cruises on Milford or Doubtful Sounds. But these two sites are many hours of steaming north of where we ended up in late November, surveying seabirds in southern Fiordland. 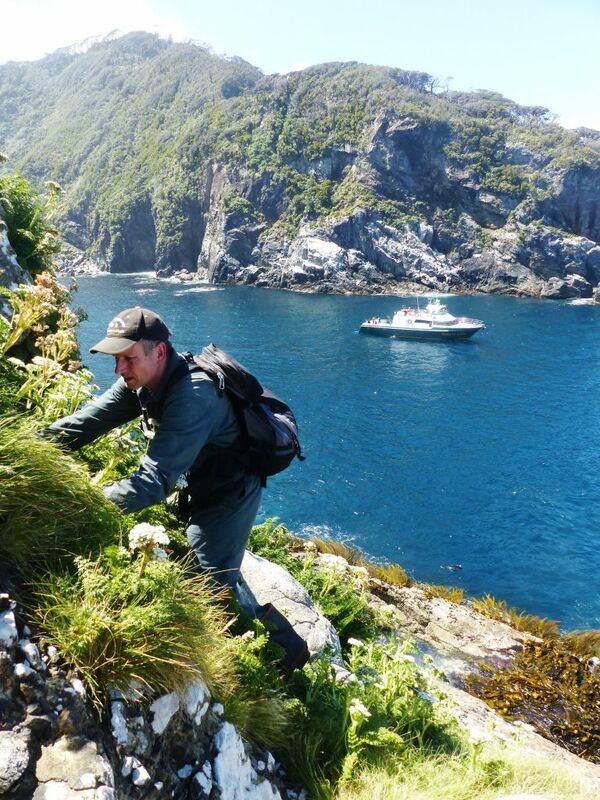 We boarded the DOC vessel Southern Winds at Deep Cove in Doubtful Sound, and it was 6.5 hours later before the team landed on Cemetery Island in Preservation Inlet – an ironic ‘start’ to the survey. The four major fjords of southern Fiordland (from Breaksea Sound south) hold hundreds of islands, and the superb weather and sea conditions in late November allowed us to achieve more than expected. 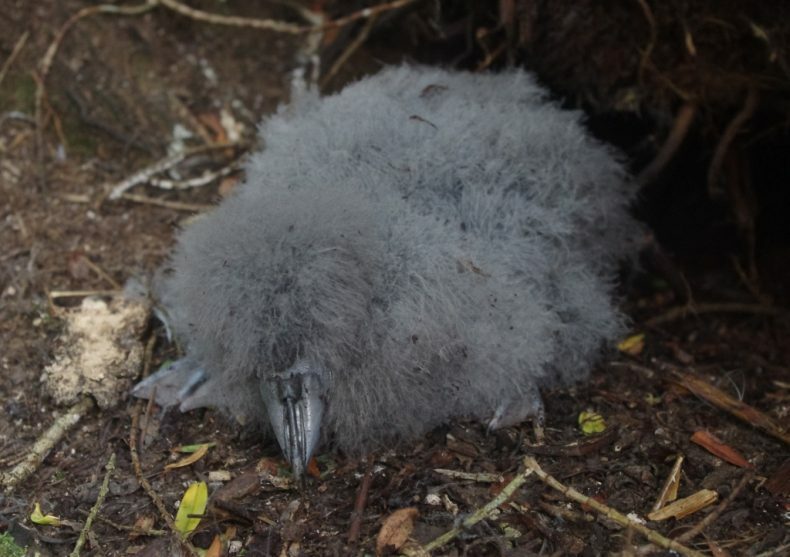 The purpose of the survey was to locate colonies of burrow-nesting petrels (seabirds), building on a highly successful Te Papa survey completed in Dusky Sound the previous November. 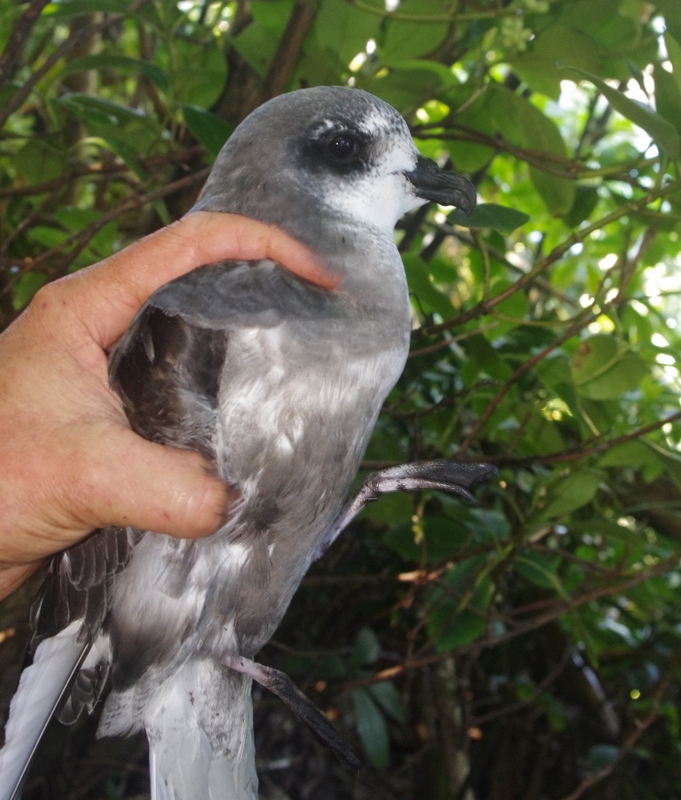 The 2016 survey resulted in 49 colonies of three petrel species being found on 44 islands, with 42 of these colonies being previously unknown or unreported. 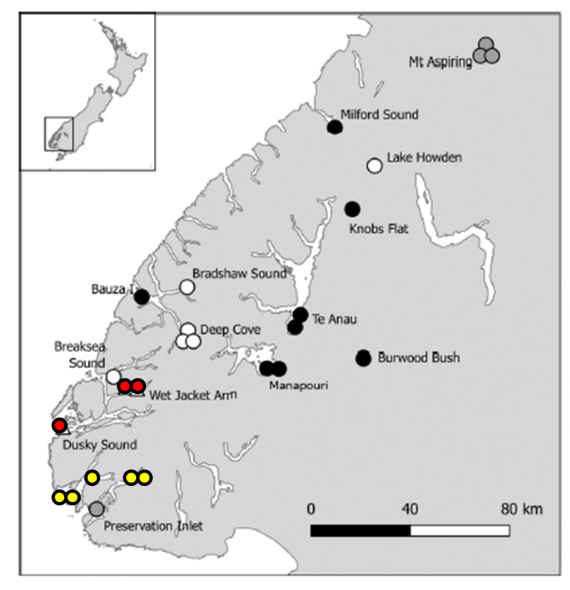 The larger islands in southern Fiordland are important sites for many rare and threatened landbirds (e.g. kākāpō, little spotted kiwi, tīeke/South Island saddleback, mōhua, and kakaruwai/South Island robin), but it was the smaller islands that we focussed on for both the 2016 and 2017 surveys. Petrels do all their foraging at sea, and can breed at densities of three or more burrows per square metre, and so even tiny islets and stacks can hold large populations. 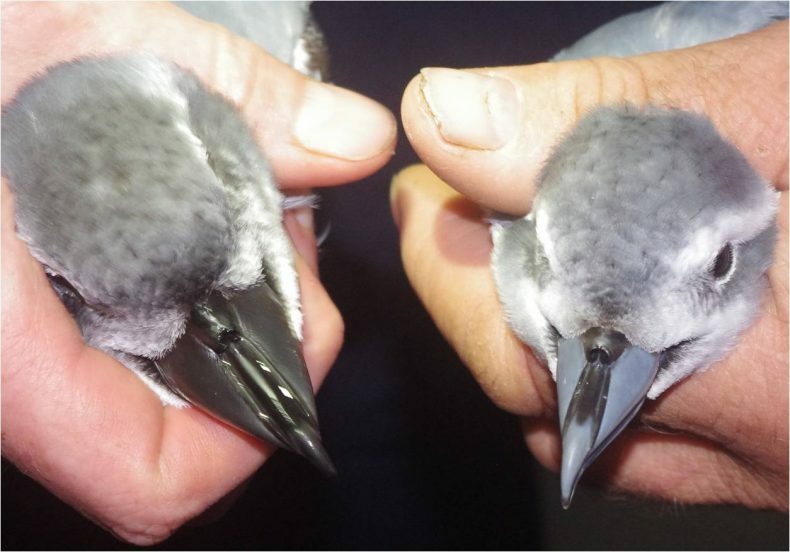 The three petrel species known from Fiordland (sooty shearwater, mottled petrel, and broad-billed prion) have overlapping breeding seasons, with November being the best month to find all three species present at the same time. Our survey technique was to locate and count burrows on as many islands as possible, and to estimate the number of burrows on each island. The next challenge was to identify which species had made or was occupying the burrows we found, with the added complication that more than one species is often present on the same island. 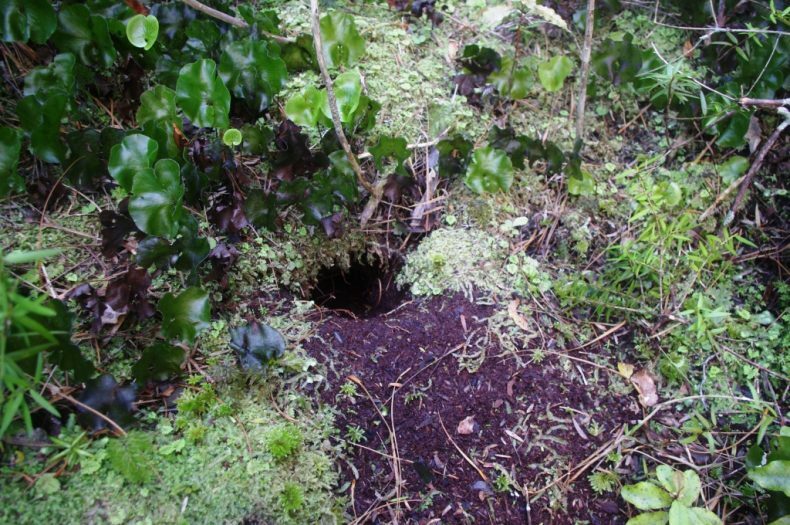 Sometimes an adult or chick might be within reach from a burrow entrance, but more often we had to identify the burrow occupants from feathers, skeletal remains, or failed eggs from previous seasons that had been dug out of burrows. 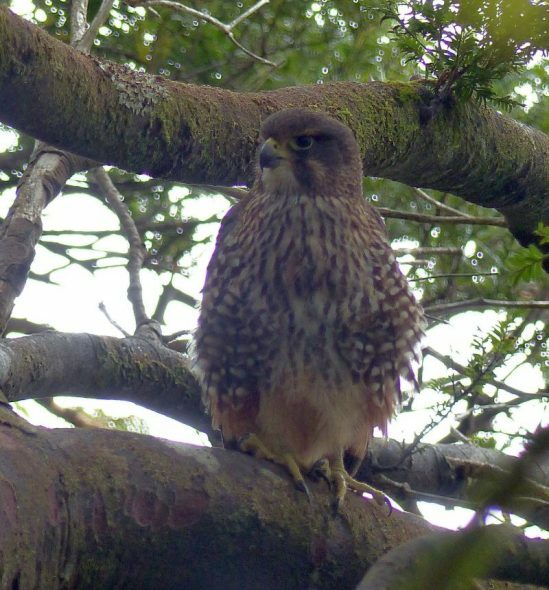 Our task was aided by plucking sites left by predatory falcons, with both falcons and their feeding sites being found on many of the islands. 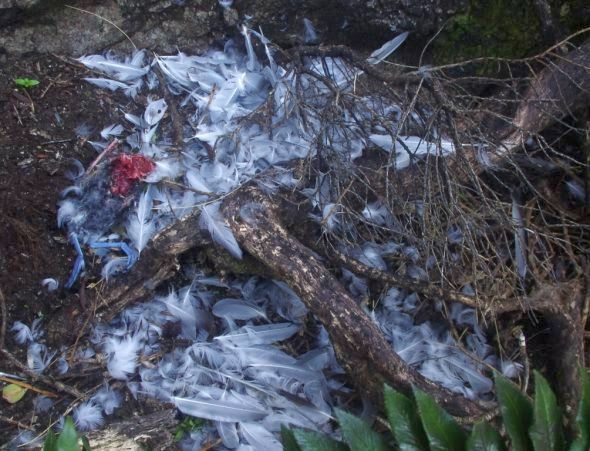 If we were unable to find birds, feathers, bones, or eggs, the petrel species present could usually be determined by characteristics of their burrows, including entrance diameter, location on the island, and the vegetation that they nested under or among. By the end of the week-long survey, we had landed on 77 islands and had found 50 petrel colonies, 33 of which were previously unknown. 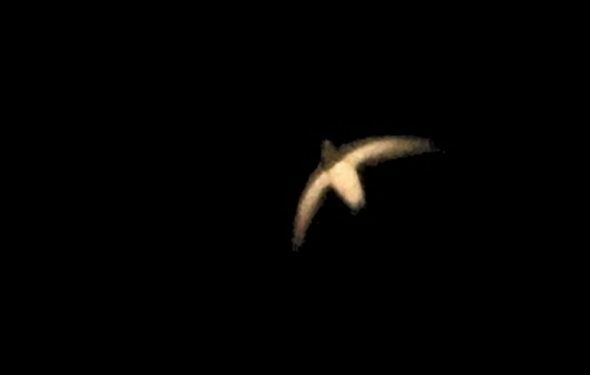 All the colonies were of the three petrel species known to breed in Fiordland, but we also encountered three additional species at night. 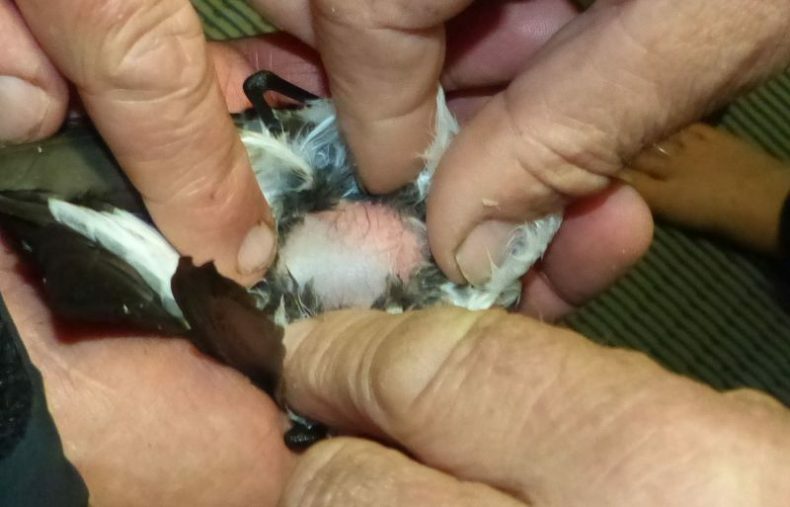 A fourth petrel species long suspected of breeding in Fiordland is one of New Zealand’s smallest seabirds – the grey-backed storm petrel. We encountered them while ‘spot-lighting’ at night at two sites in Dusky Sound last year, and were keen to find out whether they also occurred in Chalky and Preservation Inlets. 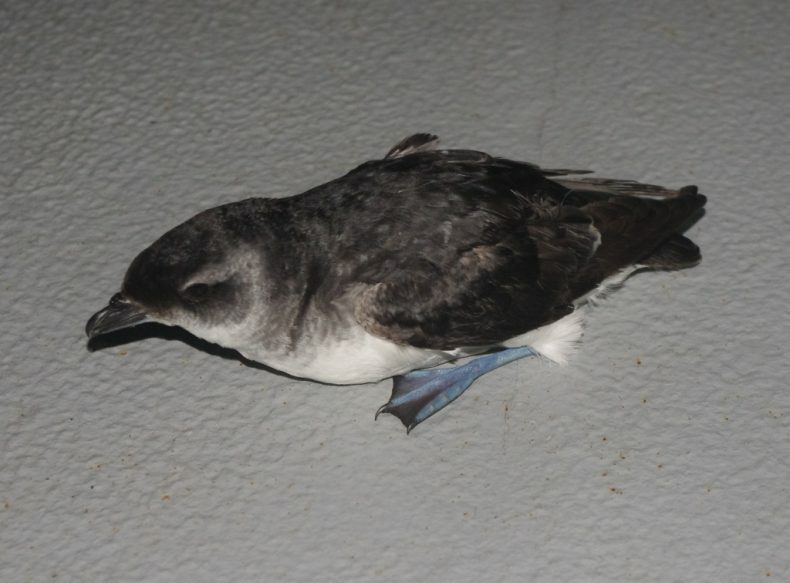 Spot-lighting is a recognised survey technique for seabirds, and we undertook standardised surveys from the boat at five different overnight anchorages. Grey-backed storm petrels were seen at three sites, with at least two individuals (and probably more) at two of the sites. 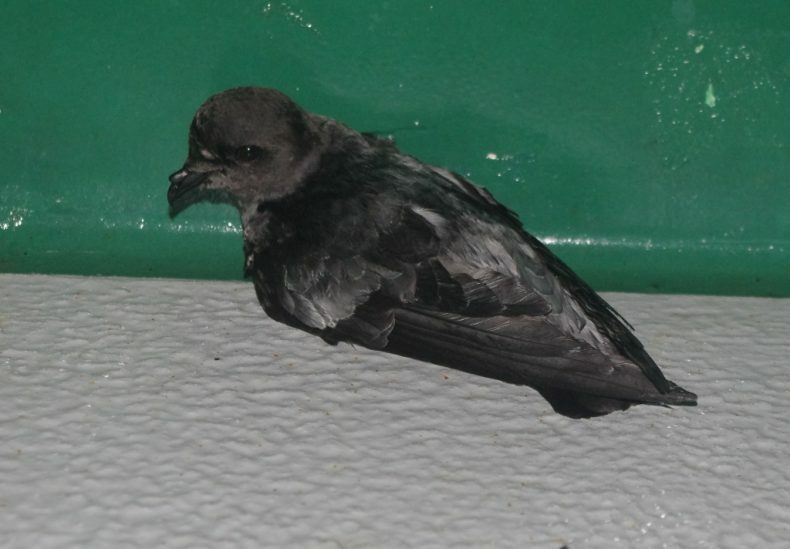 One grey-backed storm petrel was captured during a spot-lighting session, and was found to have a bare brood patch. Petrels normally have dense down under their belly feathers. However, they shed a large patch of this down when breeding, to allow effective transfer of body-warmth to their single enormous egg when incubating. The bare brood patch on this storm petrel was an indicator that it had a nest nearby – but we still don’t know where. An even bigger seabird surprise was that the first prion that we caught while spot-lighting was not the species we expected. We were anchored within a few hundred metres of a broad-billed prion colony, but the first prion captured was an Antarctic prion. 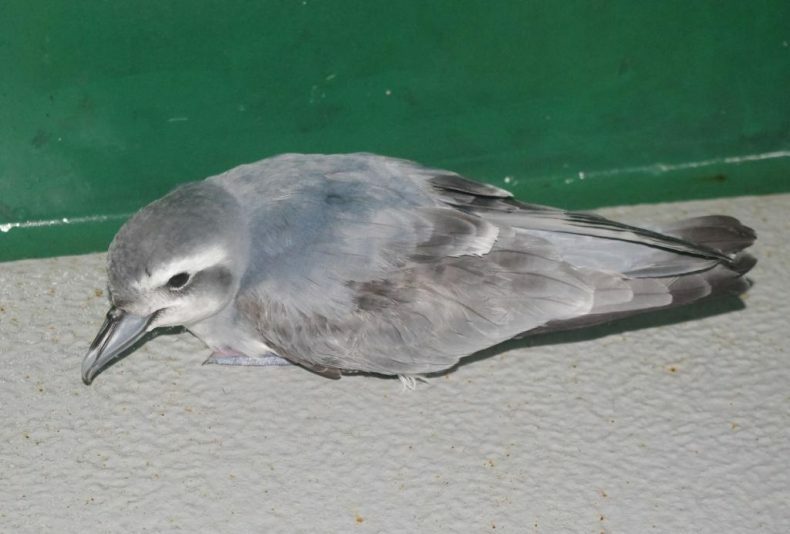 The nearest known colony for this species is on the subantarctic Auckland Islands, 500 km to the south. The bird had a downy brood patch, and so was most likely a young bird not yet in breeding condition. With many thanks to Colin Bishop (DOC) for organising the survey, Southern Winds skipper and crew Chris Pascoe and Pete Kirkman for getting us there and back safely and comfortably (and for skilfully getting us on and off so many islands), and Colin Bishop, Graeme Taylor, and Terry Greene (DOC), Riki Parata (Kāi Tahu), and Lawrie Mead for assisting with the field work on and off the boat. What fun, I would have helped!! I seem to remember the burrows on the Snares had a differing smell depending on the species occupying it. Smell is hard to categorise I realise, but a useful indicator? Thanks very much for your comments – and great to hear from you. Smell is certainly a good indicator of an active, large petrel colony, and they can often be detected before even stepping ashore. But you would need a finer nose than mine to use odour as a species-specific identification method. I am sure that dogs could be trained to do so, but seabird dogs that I have observed in action have been just as ready to indicate a penguin burrow as a prion or a diving petrel. Well done, team. We really need the research that you are doing and publishing. Thanks very much for your comments Ian. 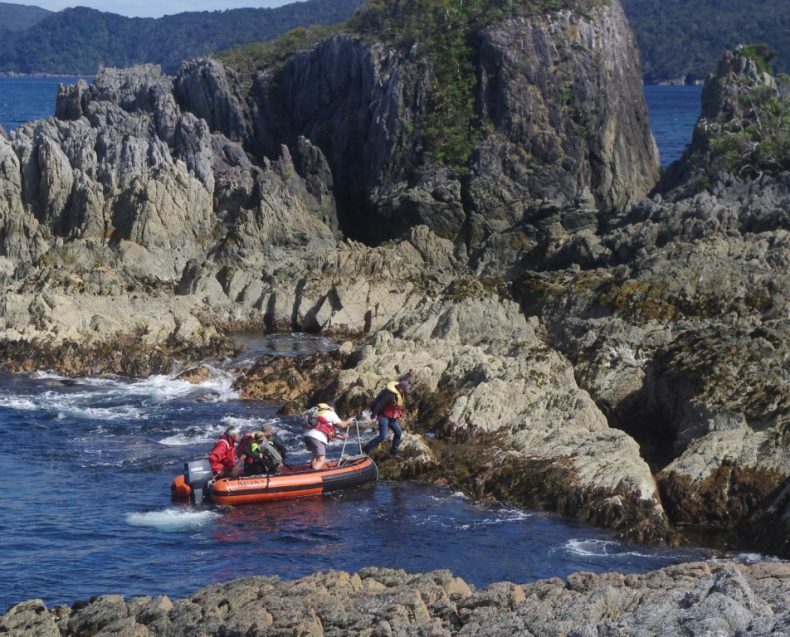 I am sure that there is a lot more to discover on the smaller Fiordland islands – this was very much an initial survey, with most of our island landings being brief, during daylight hours, and of course at only one time of the year. Plus there are many more islands waiting to be surveyed from Dusky Sound northwards. Well done. Awesome job we need to talk soon. Another very interesting tale of your travels. Thanks. Exceptionally well done, Colin. Alan too. It’s so reassuring to see that the discovery instinct is still alive and well in some quarters. 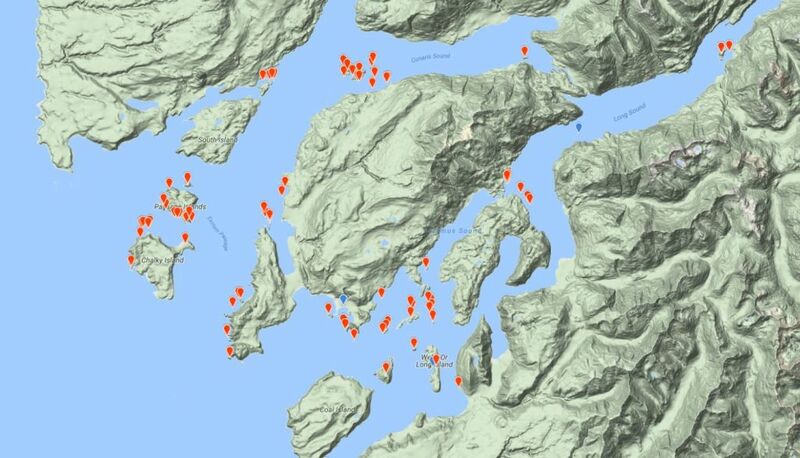 Any sign of four-footed furry intruders on any of these islands? Thanks very much for your kind words Euan, which must be shared with the whole team. At times we were split between up to 5 islands, which also meant long days with little down time for the boatmen. We are still assembling data on mammal presence on islands, but did find a few rat corpses under GoodNature A24 self-resetting traps on some of the larger islands (some of which had sooty shearwaters breeding on them, but not the two smaller petrel species). Looking forward to reading the paper! Great to see you keeping an eye on your former colleagues from afar! Wonderful work, team! Keep it up. I wonder if you could get this sort of information to RadioNZ or TVNZ children’s programmes? Thanks very much for the suggestion Tony.